Zabtik Drolchok (Tib. ཟབ་ཏིག་སྒྲོལ་ཆོག, zab tik drol chok, Wyl. 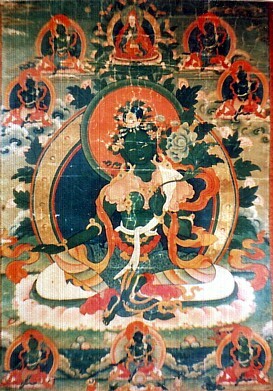 zab tig sgrol chog), 'The Profound Essence of Tara' — a popular practice of Green Tara revealed as a mind terma by Chokgyur Dechen Lingpa. Like the Chimé Phakmé Nyingtik, The Heart Essence of the Sublime Lady of Immortality, discovered by Jamyang Khyentsé Wangpo, the Zabtik Drolchok forms part of a larger yet to be revealed terma-cycle called Drolma Nyingtik, The Heart Essence of Tara. According to Dilgo Khyentse Rinpoche, while Zabtik Drolchok belongs to the kriya tantras, it applies the view of Niruttara-yoga or the Highest Yoga Tantras. Dzongsar Khyentse Rinpoche praised the Zabtik Drolchok as carrying the most blessings amongst all the termas of Chokgyur Lingpa. The full name of the outer sadhana is The Essence of the Two Accumulations, The Mandala Ritual from the Mind Treasure, The Profound Essence of Tara, and among the seven special transmissions, it belongs to the category of mind terma. The Praises to the Twenty-One Taras is recited numerous times within the practice. There is also an inner and a secret sadhana in the cycle. The inner practice is a yoga tantra practice and contains the mandala which from the eight great fears. The secret practice is a [[highest yoga tantra] practice from the Mother Tantras, belonging to the family of Hayagriva and Vajravarahi and is connected with Samayatara. The Treasure Root Text, containing the way to take care of disciples, the outer, inner and secret sadhanas, the Essential Instruction on the Triple Excellence, the puja text for the vajra guardians endowed with the certainty of the vajra words, and the various activities of the guardians (Tib. དགོངས་གཏེར་སྒྲོལ་མའི་ཟབ་ཏིག་ལས་སློབ་མ་རྗེས་སུ་བཟུང་བ་ཕྱི་ནང་གསང་བའི་སྒྲུབ་ཐབས་ལེགས་སོ་གསུམ་གྱི་དོན་ཁྲིད་རྡོ་རྗེ་ལུང་གི་ངེས་པ་རྡོ་རྗེ་སྲུང་མའི་མཆོད་བྱང་སྲུང་མའི་ལས་ཚོགས་ཟབ་མོ་བཅས་གཏེར་གཞུང་ལྡེབ, Wyl . dgongs gter sgrol ma'i zab tig las slob ma rjes su bzung ba phyi nang gsang ba'i sgrub thabs legs so gsum gyi don khrid rdo rje lung gi nges pa rdo rje srung ma'i mchod byang srung ma'i las tshogs zab mo bcas gter gzhung ldeb). The Garland of Utpala Flowers, A prayer to the masters of the lineage of Zabtik Drolchok, by Jamyang Khyentse Wangpo (Tib. དགོངས་གཏེར་སྒྲོལ་མའི་བརྒྱུད་འདེབས་ཨུཏྤ་ལའི་ཕྲེང་བ་, Wyl . dgongs gter sgrol ma'i brgyud 'debs ut+pa la'i phreng ba). The Condensed Daily Practice for The Profound Essence of Tara (Tib. དགོངས་གཏེར་ཟབ་ཏིག་སྒྲོལ་མའི་རྒྱུན་ཁྱེར།, dgongs gter zab tig sgrol ma'i rgyun khyer) by Tsikey Chokling Rinpoche. The Essential Instruction on the Threefold Excellence, from the Mind Treasure Drolma Zabtik, the Profound Essence of Tara (Tib དགོངས་གཏེར་སྒྲོལ་མའི་ཟབ་ཏིག་ལས་ལེགས་སོ་གསུམ་གྱི་དོན་ཁྲིད་ཀྱི་བསྡུས་དོན་ལྡེབ, Wyl. dgongs gter sgrol ma'i zab tig las legs so gsum gyi don khrid kyi bsdus don ldeb), by Chokgyur Dechen Lingpa. English Translation: The Essential Instruction on the Threefold Excellence, from the Mind Treasure Drolma Zabtik, the Profound Essence of Tara, in Tulku Urgyen Rinpoche and Trulshik Adeu Rinpoche, Skillful Grace: Tara Practice for Our Times, translated and edited by Erik Pema Kunsang and Marcia Binder Schmidt (Rangjung Yeshe Publications, 2007), 29-36. Adeu Rinpoche, Jamgon Kongtrul, and Chokgyur Lingpa. Skillful Grace: Tara Practice for Our Times. Translated and edited by Erik Pema Kunsang and Marcia Binder Schmidt. Hong Kong: Rangjung Yeshe Publications, 2007. Chokgyur Lingpa, Adeu Rinpoche, Orgyen Topgyal Rinpoche, and Jamyang Khyentse Wangpo. The Tara Compendium: Feminine Principles Discovered. Translated and edited by Erik Pema Kunsang and Marcia Binder Schmidt. Hong Kong: Rangjung Yeshe Publications, 2015. Chökyi Nyima Rinpoche has taught extensively on the terma text, which can be studied online.